Balloon angioplasty as a treatment for peripheral arterial disease is an example of an important technology that has been underused. Too often, if a patient's symptoms can not justify the risks involved in surgical treatment, the patient is told no treatment is available and pain can only be avoided by decreasing activity. In fact, there is a third very effective option - balloon angioplasty. Balloon angioplasty is a minimally invasive procedure used to open blocked arteries. Over 6000 angioplasties have been safely performed at We Care partner hospital and is recognized internationally for its extensive experience and expertise in performing this procedure. Normally when walking there is an increase in blood flow to the legs to provide increased oxygen to the muscles. If the artery supplying the legs is narrowed it may not be possible to supply enough blood to the muscles resulting in severe cramping in the calf or thigh. This pain (called claudication) goes away after a few minutes rest but will return once the patient begins to walk again. This is called intermittent claudication and is the classic symptom of decreased blood flow due to narrowing of the leg arteries. The simplest treatment is a walking program which itself may gradually increase the distance a patient may walk without pain. Unfortunately this treatment will not return the patient to anything like a normal tolerance for exercise. Often the patient must give up the pleasure of walking with friends, shopping or playing golf. These are the type of activities that most experts believe should be promoted in the elderly as they are important to an aging person's mental health. The commonest surgery is to create a bypass around the obstructed artery. This operation usually results in excellent blood flow to the leg and is long lasting. However, this is major surgery requiring a general anesthetic and may pose an unacceptable risk for elderly patients. The mortality and morbidity of this surgery is high enough that most surgeons will not consider operating unless the patient is disabled by very severe claudication. In addition, the bypass usually uses the largest vein in the leg. This vein will therefore not be available if the patient someday requires a heart bypass. Balloon angioplasty does not require a general aesthetics or hospital admission. Complications are usually not severe and certainly not life threatening. The long term results of angioplasty are comparable to that of surgery. If the artery does narrow again at a later date the procedure can be repeated whereas if a surgical bypass fails another suitable vein may not be available. A plastic catheter with a sausage shaped balloon at the tip is placed within the area of narrowing under fluoroscopic guidance. The balloon is inflated several times for periods of 10 seconds then withdrawn. 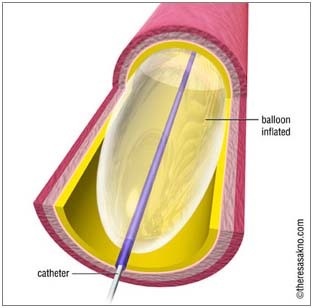 In some cases the balloon is covered by a fine metal tube which is expanded by the balloon and remains in the artery when the balloon is withdrawn. 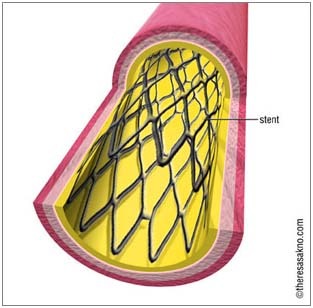 This is called a "stent" which helps to ensure the the dilated artery maintains a normal diameter. If angiograms of the legs have been done elsewhere you should arrange to have them sent to We Care India so we can determine if angioplasty is possible. Before angioplasty is performed a doppler (ultrasound) examination of the blood flow to the legs will be obtained. This is a painless test that takes about half an hour. The patient lies on an examining table while the technician passes a soft probe over the affected leg. An image of the artery can be seen on a TV screen and the blood can be heard passing through the vessel. Both the image and a tracing of the blood flow will be recorded on a VCR. This procedure will be repeated following the angioplasty. Angioplasty is performed under local anaesthetic. A small area in the groin is "frozen" using a fine needle. A catheter is then inserted through the skin into the artery. For angiography this catheter is 1.3mm in diameter (smaller then the needle used when you donate blood). 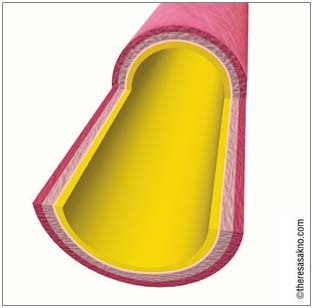 The angioplasty balloon catheter is 1.6mm wide. The catheter produces no sensation as it is manipulated in the artery. 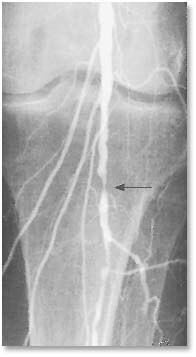 If an angiogram is to be performed, contrast (dye) is injected through the catheter while digital X-Ray films are obtained. The new type of contrast used produces only a mild warm sensation in the back and legs that lasts about 10 secs. The whole procedure should take less than 1 hour. 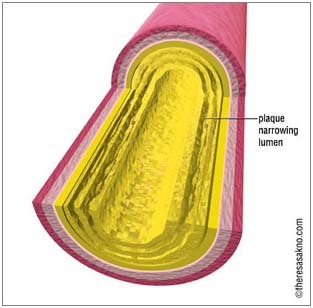 The technique for angioplasty is similar. As the catheter must be guided through the area of narrowing or obstruction, the procedure may be more prolonged but still can usually be finished in less than 1 hour. During this time there is no pain and most patients are absorbed in watching the movement of the catheter on the TV screen. When the balloon is inflated a mild ache may be experienced in the area for 5-10 seconds. Following withdrawal of the catheter from the groin the physician will apply hand pressure over the puncture site for 10-15 minutes. You will then be placed on a stretcher and returned to your private cubicle. Patients who require arterial catheterization are observed for a period of 2 hours after the procedure while those who have undergone balloon angioplasty are kept on bed rest for 4 hours. To make the recovery period as comfortable as possible, you will rest in a private cubicle adjacent to the nursing station. Each cubicle is equipped with a color TV and a DVD player. You may watch TV or a movie to help pass the time. Relatives or friends are encouraged to join you at this time. Following discharge you will be instructed to limit your activity to bathroom privileges for the next 24 hours and not to return to full activity until 48 hours after the procedure. You are encouraged to report any problems. For this purpose, a pager number will be given to you on discharge that allows you to contact the angiographer or charge nurse 24 hours a day. You will be asked to return for an ultrasound doppler examination in six months to assess the results of angioplasty. If symptoms recur, you should see your own physician or make arrangements to return to We Care India partner hospital for repeat doppler examination and possibly a repeat angioplasty if there is evidence of restenosis.